Partial knee replacement surgery is where an orthopedic surgeon replaces one side of the knee joint, usually due to damage caused by arthritis. Most commonly, it is the inner side of the knee that needs replacing. It is also known as a unilateral knee replacement or uni knee. Partial knee replacement surgery has the advantage that it is less invasive and quicker to recover from than a total knee replacement. However, it is not suitable for everyone and there are strict guidelines to follow. Here we will look at what goes on before and during the surgery and what the benefits are of having a partial knee replacement over a total knee replacement. We will then look at the rehab and recovery phase and common problems associated with surgery. You will normally have a pre-op appointment a few days or weeks before your partial knee replacement surgery where the surgeon will talk you through what is going to happen. You should also see a physical therapist who will go through exercises for you to do after the operation. It is well worth doing these before the surgery as the stronger and more flexible your knee is before surgery, the quicker you will recover. In the knee replacement exercise section you will find loads of suitable exercises that you can do before and after surgery to get the best results. An incision (cut) is made on the front of the knee to expose the joint. 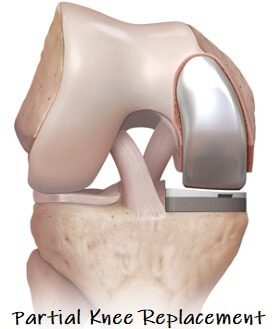 The surgeon will assess the joint to ensure that a partial knee replacement is suitable. Occasionally the extent of the arthritis does not show up clearly on x-ray and partial knee replacement surgery may not be suitable after all. 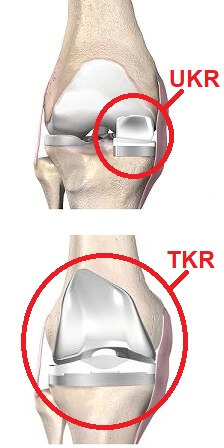 If this is the case, the surgeon will perform a total knee replacement (TKR) instead. You should have been consented for this prior to surgery. The arthritic parts of the bones are removed and then replaced with the prosthesis (new joint made of metal and plastic) which is attached to the ends of the thigh and shin bones (femur and tibia) working to re-line/resurface the joint. The prosthesis is then secured in place with cement and the wound is stitched up. The whole operation takes about 1.5hrs.